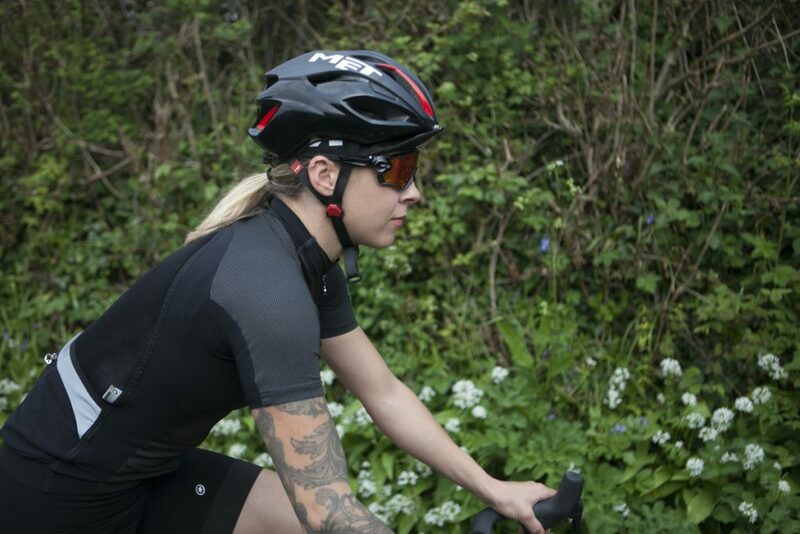 Assos just released their brand new women’s specific Off Road rally jersey and bibshorts so I hopped on the CX bike and headed off down the local Bridleway to check them out for the first time. Assos began from scratch when designing this new line rather than just changing up one of their existing products, so the shorts are really different from Assos’s other women’s offerings. The fabric feels strong and supportive – it’s thicker and more robust than the silky fabric of something like the S7 LaLaLai shorts, so should be able to withstand a bit of mud and the odd stone being flicked up. As the outer face of the fabric is textured rather than smooth, any accidental abrasions probably won’t show up like they would on something smoother. The cuffs do a good job of anchoring the legs of the shorts which helps minimise any rubbing or chafing and the hand stitched chamois means you stay comfortable on the saddle. The soft, seam free straps are unusual in that they cross at the back and do up with a magnetic closure at the front. It means you don’t need to remove your jersey to go to the toilet. You’ve also got some removable hip pads, in case you feel the need for some impact protection. The jersey is quite a work of art. Constructed from 5 different fabrics, it makes use of 25 patterns and features a full length zip, three pockets and interestingly, a mesh back. The mesh back means its mega ventilated so you should stay as cool as can be, though its recommended that you wear the accompanying base layer underneath for protection from the sun. Again, the cut is super and it fits like a glove. The sleeves are short, side panels are nicely tailored and the collar looks rather smart – it’s part of the same piece of fabric as the body of the jersey, rather than being stitched on separately. In conclusion? A really rather nice outfit. Thanks Assos!